And yes, of course you can also make summer berry sauce all winter using frozen berries. I usually make it with blackberries, but today’s version was raspberry. The only real requirement here is that you whisk the cornstarch into cold water until smooth; if you add the cornstarch after the sauce is warm, it will clump. Weird, huh? Other than that, feel free to play around, you really can’t go wrong. Summer Berry Sauce: In a medium saucepan, whisk 1 Tb. cornstarch with 1/3 c. water until smooth. Stir in 1/3 c. sugar, 2 c. berries (fresh or frozen), and 1-2 Tb. lemon juice (to taste). Cook over medium heat, stirring frequently, until thick and bubbly. That sounds like a perfect Sunday breakfast (or birthday breakfast). Have ou posted the recipe for chocolate pancakes? What a lovely way to start off a birthday. Especially since it’s not for a few days! We know how to draw them out. And we occasionally observe half-birthdays as well. Any excuse to celebrate! Yay! Thanks. 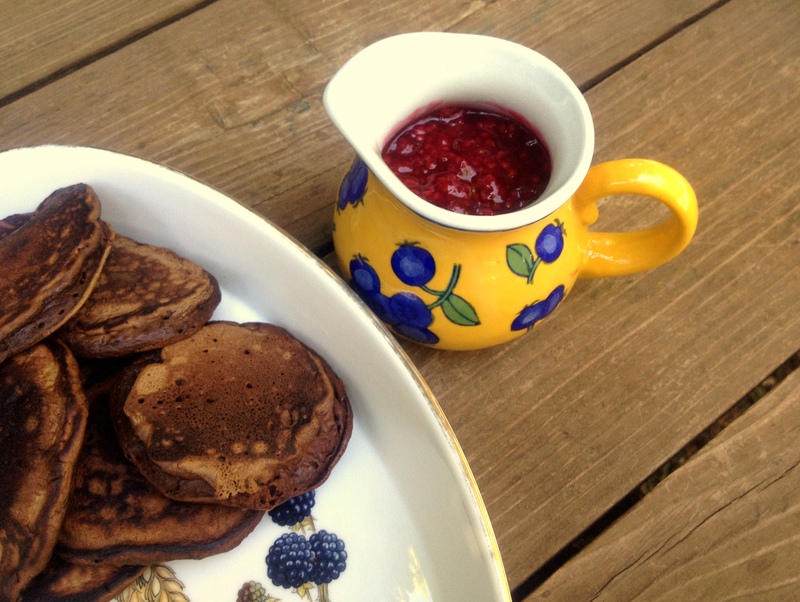 We have guests coming, so chocolate pancakes with berry sauce sound like just the thing. I really find it hard to control myself at those u-pick places–let’s see, we need a few pounds to eat, a few pounds for pies, a few pounds to make this sauce over and over–and a few to infuse a delicious drink, of course! It gets pretty unreasonable. The “u-pick” is actually my parents’ farm, and my mother always helps me pick. I enjoy getting a bit carried away with it. Cherries, on the other hand… last year we came home with 24 lbs from the u-pick! Such a lovely thing to do with berries – perfect with vanilla ice cream in my opinion! I keep coming across chocolate waffles and pancakes. Why am I so deprived? Have I been living under a rock? These look wonderful! what a wonderful complement to chocolate pancakes. This would be great with brownie waffles. have you ever done that? My kids used to love it when I made homemade brownie batter and cooked it in small batches in the waffle iron. It was the bomb. This sauce would be killer on that. Wow, BROWNIE waffles sound like a big step up from the (probably whole wheat) chocolate birthday waffles I made last year. Great idea!! Take me back to my youth…..PLEASE! Looks good! Cornstarch? I never would have thought of that. Does it thicken it a lot? Or does it just make it glossy? Speaking of corn starch, have you ever used it with your kids to make oobleck? It’s so weird! No edible, but totally non-toxic and fun.